disclaimer: i realize this kind of sounds like a black forest cake, which it basically is. oh, well. i don’t think your eaters will care whether you call it a cherry garcia cake or a black forest cake. it’s been 11 days since i’ve baked, though the withdrawal hasn’t been too bad. i’ve been busy with a couple clubs (a diy art club i’m an officer for, even though i’m not artsy at all hah and a cultural one where i’ve met some really great, chill people) and getting settled into my new apartment. all fun stuff and i’m so grateful that this year’s welcome week wasn’t nearly as awkward and thumb twiddling waiting for classes to start. ask me next week (quizzes already, ack), and my answer will be different. 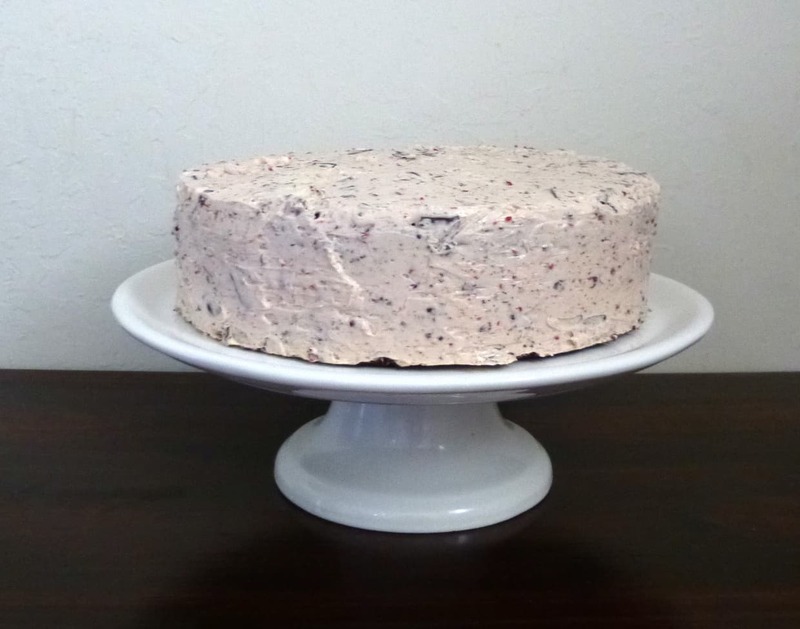 in celebration of the start of a new school year, here’s a cherry garcia cake. i didn’t like how much sugar was in confessions’ buttercream, and i wanted real cherries not maraschino. so, half a batch of smbc it was. don’t do half a batch unless you want a very thin coat of frosting everywhere and are willing to patch up lots of parts and you don’t like frosting (uhm you might need to excuse yourself if you’re not into frosting, though). i used cherry jam and finely chopped (otherwise the big chunks are annoying to get around when you frost) chocolate in frosting. (defrosted) frozen cherries got introduced as part of the filling in between the cakes. ignored the ganache and garnished with chocolate shavings instead. either is easy and pretty. the cake is moist and v chocolatey. this might be my #2 favorite chocolate cake recipe (behind the elisa strauss version which uses a whole cup of strong coffee). i thought that it didn’t have enough cherry, and i’d suggest using more cherries in the middle or melting down some jam and spreading that on the cakes before adding the buttercream and cherries. you could use more jam in the frosting, but i’d be a bit hesitant because too much could lead to the frosting curdling. i didn’t think there was enough frosting; however, my parents liked the cake heavy ratio. so if you like the look of the cherry garcia cake above, use the amounts in the frosting below. if not, double it (and be merry). *The buttercream recipe that follows is a half batch; feel free to double it. Combine the sugar and dry ingredients. Add eggs, milk, oil, and vanilla; beat on medium speed for 2 minutes. Slowly stir in 3/4 cup boiling water. Pour into two greased and floured 9” round cake pans. Bake at 350F for 30 – 40 minutes, until cakes spring back when touched. Cool in pans for about 10 minutes, then move to finish cooling on wire racks. Whisk the egg whites and sugar over a simmering pot of water until the sugar dissolves and the mixture is very hot. Beat until the meringue holds stiff peaks and reaches room temperature. Add the butter a few cubes at a time. Beat in the cherry jam and chocolate. Level the tops on the cakes. Split each cake in half. You can spread the cut surface of 3 layers with melted jam, but that’s optional. Spread the buttercream on the same layers, then sprinkle with chopped fresh cherries. Stack them, with the unfrosted cake on top, cut side facing down. Frost the outside with buttercream. Garnish with cherries, chocolate, etc. Refrigerate until ready to serve.